Submitted by Anderson Packaging, Inc. on behalf of Novartis Pharmaceuticals Corporation, the Novartis Tasigna Starter Kit is a comprehensive introductory pack for adult patients initiating therapy for treatment of Ph+ Chronic Myelogenous Leukemia. The package features a compliance prompting, calendarized unit dose pack with 28 capsules comprising 7 days of therapy, utilizing the MWV DosepakR child resistant design. Concise graphics guide the patient to the dosing regimen. Outer graphics highlight the opening instructions for the novel, child resistant features incorporated into the pack design. Supplementing the therapy, the Novartis Tasigna Starter Kit contains many supporting elements to assist patients, including an instructional card guiding patients to co-pay assistance programs, a patient education program DVD, a USB device containing education materials, and disease state education. In addition, the pack contains a record keeper to track medications. The pack includes a wheel for patients to determine the appropriate intervals for product dosing and consumption of food. Information and guidance is included to enable effective reimbursement for script fills. The pack also includes a patient medication guide brochure. All of this information is conveniently housed in an innovative carton design. The six judges were impressed by and commented on the comprehensiveness of the package, particularly the food wheel guide that was provided. One stated in their remarks, “…this package is one of the most comprehensive I’ve ever seen. While effectively delivering the product (and protecting it), the kit provides detailed medication guides, patient support, financial support, and information for prescribers.” Another commented, “Pleasing graphics, well-written guidance materials convey a caring tone to the patient, without minimizing the risks of the therapy. Extraordinary attention seems to have been dedicated to this package. The Burgopak Child Resistant (CR) Slider pack incorporates the engaging operating system of the original Burgopak design, while also including senior friendly features. This entry was submitted by Burgopak Healthcare & Technology and is manufactured by McKesson RxPak. To open the Burgopak CR Slider the patient has to push two buttons, one on either side of the pack while simultaneously pulling the end tab. The pack opens to reveal the blister, held in a plastic tray on one side and the patient information in an easy to read booklet format on the other. Once the patient has accessed the medication they simply push the end tab back into the pack and it re-engages the CR lock. As the pack itself is CR, there is no additional requirement for tougher CR blister foils, making the pack easier to use for both seniors and those with reduced dexterity. Calendar blister formats can also be used to further assist adherence. The Burgopak CR Slider pack successfully achieved the U.S. Consumer Product and Safety Commission’s F=1 for child resistance and senior friendly effectiveness. The pack encourages compliance by keeping the blister, patient information and outer carton connected at all times, it also keeps the pack compact and portable. 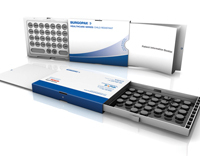 The judges agreed on the innovative, novel design of the Burgopak package, as their ratings on its features including its ability to increase pharmaceutical compliance, the innovative design, unique packaging features and user friendliness all garnered it a similar score to the top winning package of 2011. One judge commented that he is “anxious see what impact this unique configuration can have on patient adherence. Also submitted by Anderson Packaging on behalf of Forest Pharmaceuticals, Inc., the Forest ViibrydTM 30 day Starter Pack which utilizes Anderson Packaging’s IntuiDoseTM which won the First Runner Up category. One of the judges remarked, “Compared to the other packs being judged, this one has to deliver more complicated instructions because the dose or med varies for three different time periods during the month. That presents the only real challenge to the patient. Assuming the physician or pharmacist offers some initial instruction, this is truly a winning package. It’s actually enjoyable to unfold, and the graphics do a terrific job in their use of color to help the patient follow his or her drug regimen. Instructions are easy to access, pills look easy to use, and it’s apparent what has been taken. Kudos to the package designer(s). The 2011 Compliance Package of the Year Second Runner Up package is Walmart’s New and Improved Shellpak® Adherence Package. MWV Healthcare’s Shellpak is designed to improve medication adherence alone or in combination with other adherence therapies. Shellpak features a child-resistant and senior-friendly outer plastic shell that protects medication tablets packaged in a 30-day calendar blister card. 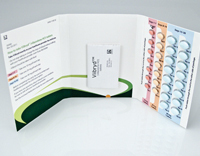 The large, flat blistercard and package surface allows for dosing instructions and patient education to be printed in large, legible fonts. This particular Shellpak is considered new and improved because the plastic shell is made with 17 percent less plastic, leading to an estimated savings of more than 750 tons of plastic per year. Additionally, a barcode window added to the Shellpak now enables the pharmacist to scan the barcode without sliding the blister out of the package. Another significant feature of MWV’s Shellpak, is that it heralded new and unprecedented data, published in the Journal of Clinical Therapeutics, demonstrating statistically significant improvement in patient adherence over vials. This study, using Walmart pharmacy dispensing data from more than 3 million individuals demonstrated that an adherence strategy involving calendarized blister packaging, of even small effect size at the individual level that is broadly implemented on a population level, could significantly leverage therapeutic efficacy and provide substantial public health benefit.